When you need to move your home or office, get in touch with the best around. 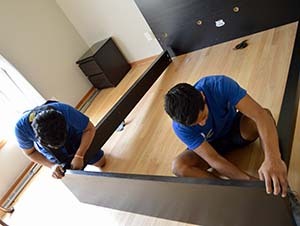 Not only are our movers professionally trained to move furniture and other items the right way, they are friendly and competent to result in a quality experience from start to finish. Fueled by a decade of experience, we understand moving can be a great source of stress and therefore can provide a cost-effective solution. While we have a main office located in Rochester Hills, we serve the entire Birmingham area as well. Moving next door? What about across the state? We are here to help. Home to 20,000 at last check, Birmingham is one of our favorite places to work! This beautiful city is located on the north side of Metro Detroit, with established neighborhoods rich in history. When it comes to packing, we are the ones to call. Not only will we wrap and pad your valuables, couches, appliances and more, we’ll also provide carpet shields at a minimal extra cost. Serving the Metro Detroit area for more than a decade, Affordable Moving Services LLC is your first choice in all kinds of moves, whether you’re buying your first house, upsizing, downsizing or uprooting your whole office. Because our team knows just how overwhelming moving can be, we go to great lengths to care for your furniture, electronics, and other belongings to ensure safe transport at all stages. We are a BBB Accredited Business that offers free quotes on services of all kinds, from residential moves to commercial relocations. Here at Affordable Moving Services, you’re making the smart choice in choosing us to handle your next move in Birmingham. Let us take care of the logistics while you concentrate on more important things. If you wish, our trained packers can pack up all your stuff using quality packing and shipping materials to keep your valuable belongings remain safe during all phases of the move. Our local moves can often be done on the same day. Count on the professionals at Affordable Moving Services who consistently work hard day after day to handle all the details to result in a stress-free move. We do it all: full-service commercial and residential moves to just loading up your truck. Make the right move hiring our small family owned business, bringing you more than a decade of experience. For more information on our services in Birmingham, please contact us today at (248) 260-7026 or email us at affordablemovingservices@hotmail.com.